When you think Halloween, you think CANDY. One of the hottest trends in the last few years have been the presence of candy tables at parties and weddings. The best candy displays are the tables where the candy matches the color & theme of the event. We've even done candy tables with all family favorites. The display is all about the mix of containers ~ so, make sure to use a variety of sizes and heights to accomplish the most delicious table. Provide small bags and custom labels for your guests to take the candy home. Everyone always loves the sweet treat! 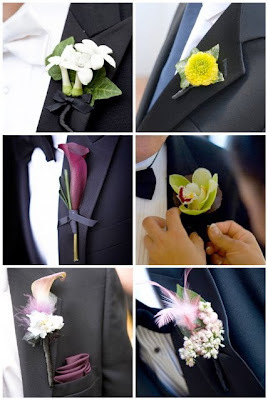 New Blog Post For Inside Weddings; Handsome Boutonnieres! I just finished my latest post for Inside Weddings, where I show a little flower love for all the men in the bridal party. If you're going with a floral boutonniere I give you style choices and some tips on what types of flowers work best in a boutonniere. I also give some ideas on how to reflect the style of the groom in the boutonniere by incorporating non-traditional elements. 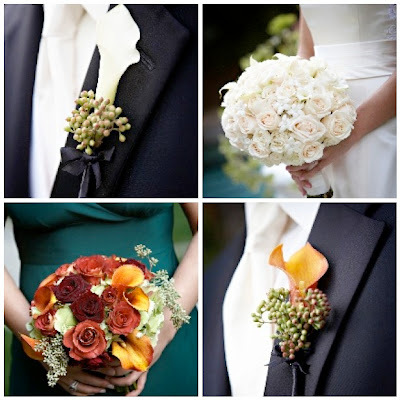 There's lots to learn about boutonnieres so check it out here. This time of year, they are everywhere we look, they come in all shapes and sizes and have more uses other than being a main ingredient for holiday pie...yes, you guessed it, it's Pumpkins!!! 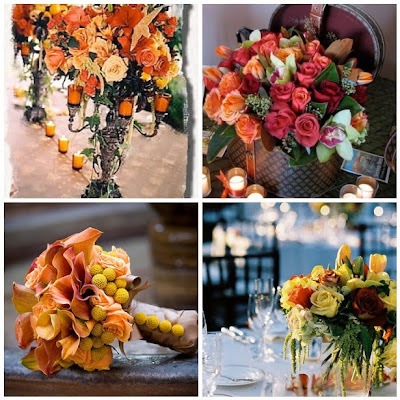 Here at the Hidden Garden we use pumpkins of all colors and sizes both as unique floral "vases" as well as part of the actual arrangement. 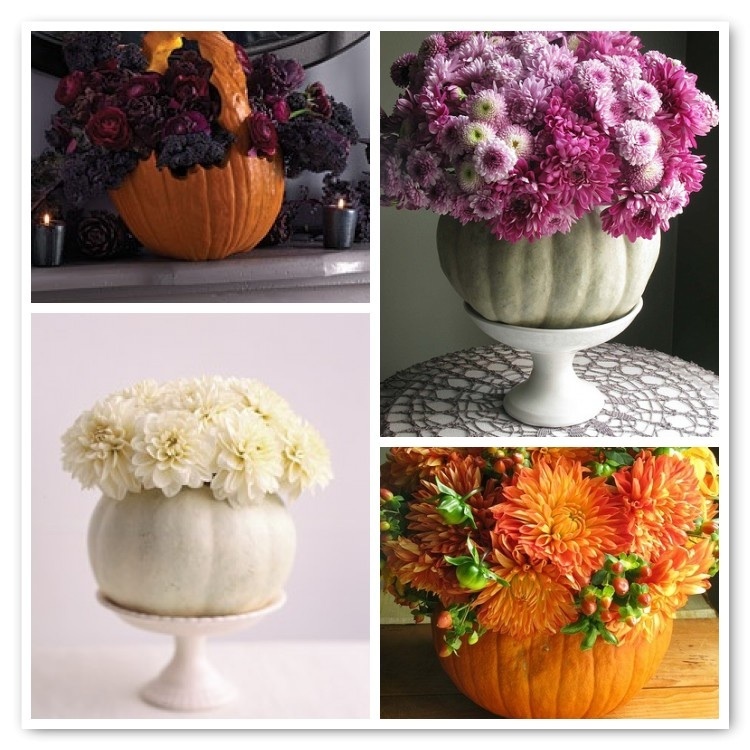 With the many varieties of pumpkins available your decor isn't limited to Autumn colors. 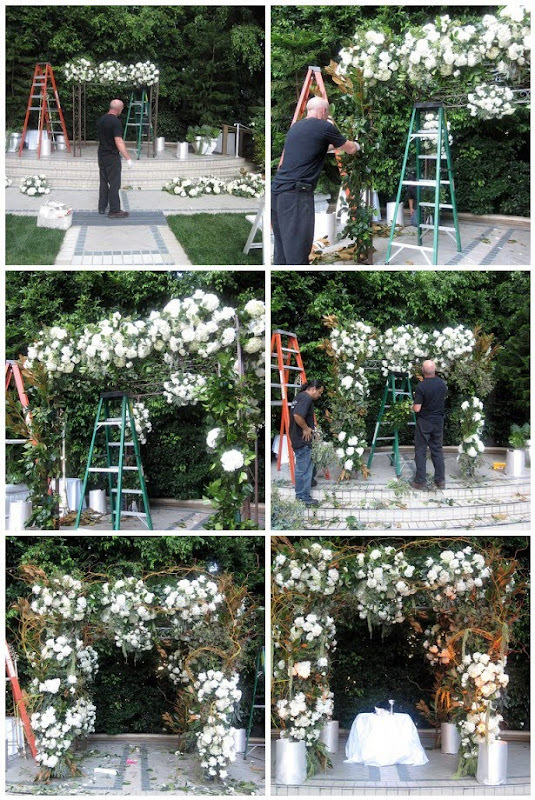 As you can see in the arrangements below provided by Martha Stewart and Eddie Rose, the possibilities are endless. The halloween basket with deep reds and purples is perfect for your halloween decor. Alternatively, a monochromatic arrangement can look exquisite anywhere in your home. A cinderella pumpkin filled with a bright pink flowers can put a smile on anyone's face this season. Don't forget, it's always great to line your Thanksgiving table and decorate your home with arrangements evoking all colors of the Fall season. You are only limited by your imagination. This holiday think outside the box and inside a pumpkin! This past weekend The Hidden Garden was asked by a local sorority at USC to create some floral arrangements for a few of their new pledges. We had fun designing something that was beautiful yet unique for each girl. We choose to convey a youthful feel so we adorned the vases with jewels, ribbon treatments and beauitful fabrics. Each treatment allowed us to create a unique design for the vessel and then filled with florals in complimentary tones allowing each arrangement to stand out. Congratulations to all the new pledges out there!! We hope The Hidden Garden was able to bring a little sunshine to your day! Aly & Dave were two of the most lovely bride & groom's that we've worked with. You can even see the love in their eyes in the pictures we're posting. 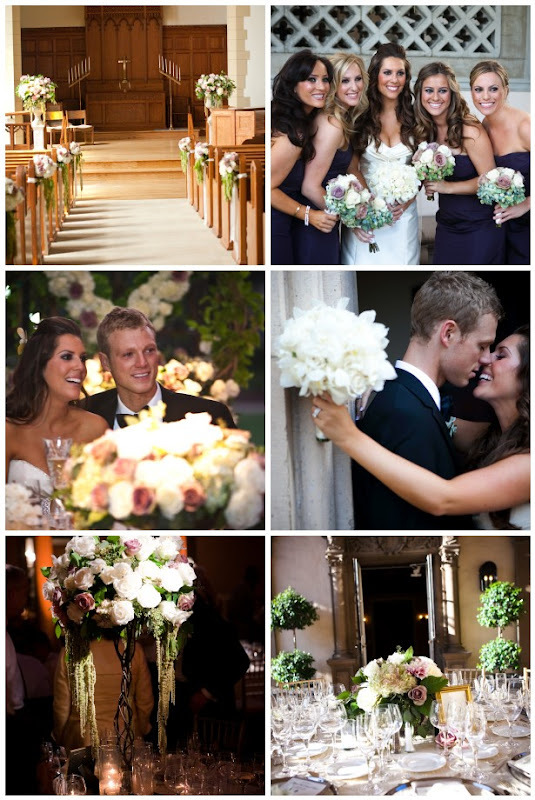 It was our first wedding at the Athenaeum in Pasadena, and it was charming and beautiful. The outdoor courtyard created a romantic and Tuscan inspired setting. To compliment the feel of the area, we added textured greenery to the arrangements to give a warm and drippy feeling to the flowers. 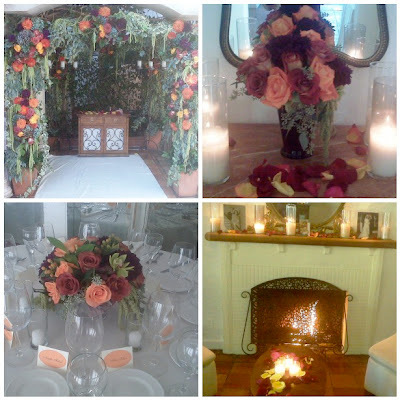 The use of high and low centerpieces created a mix of looks in the area that kept your eye moving all around the space. The beautiful architecture really enhanced the wedding; and, of course, the bride & groom were sparkling themselves. Thank you Greg Bumatay for all the amazing pictures! 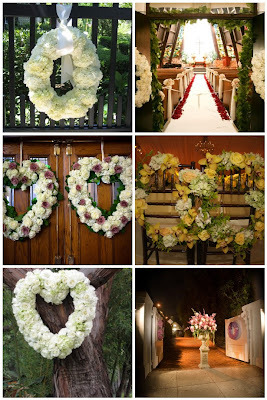 New Blog Post For Inside Weddings; Wedding Wreaths! The holidays will be here before we know it and there is definitely one thing everyone love's to decorate with during this time of year - wreaths! While wreaths are a holiday classic, I actually love to use them as wedding décor all year round. They really are a blank canvas and can be used to add a decorative touch to so many parts of a wedding ceremony and reception. Read all about my ideas for wedding wreaths on Inside Weddings here and if this post got you thinking about holiday wreaths you can always order them here! 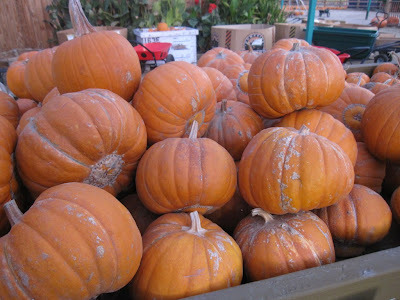 Today's favorite flower market finds today....pumpkins, pumpkins, pumpkins!! 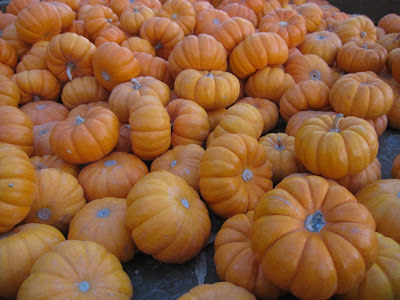 There are so many varieties to choose from when searching for the perfect pumpkin! 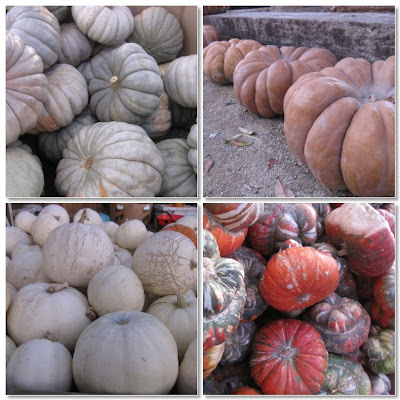 Sugar Pumpkins, Cinderella Pumpkins, White Pumpkins, Ornamental Gourds, Mini Pumpkins...who knew there were so many different types! Which is best for you?
" I will fully gush when I am more awake but OH MY GOSH. The flowers were RIDICULOUS. That is probably be best way to describe them. These were my dream flowers times 100. I have honestly never seen such gorgeousness in my life. You didn't tell me you got the dahlias!!!! I seriously went nuts when I saw the centerpieces! I could not stop staring at them. And the chuppah ahhhhhhhh. Everything was such a dream! Both the moms also flipped out when they saw the flowers! You and Amy are absolutely amazing and o cannot thank you enough for giving our families this dream wedding." 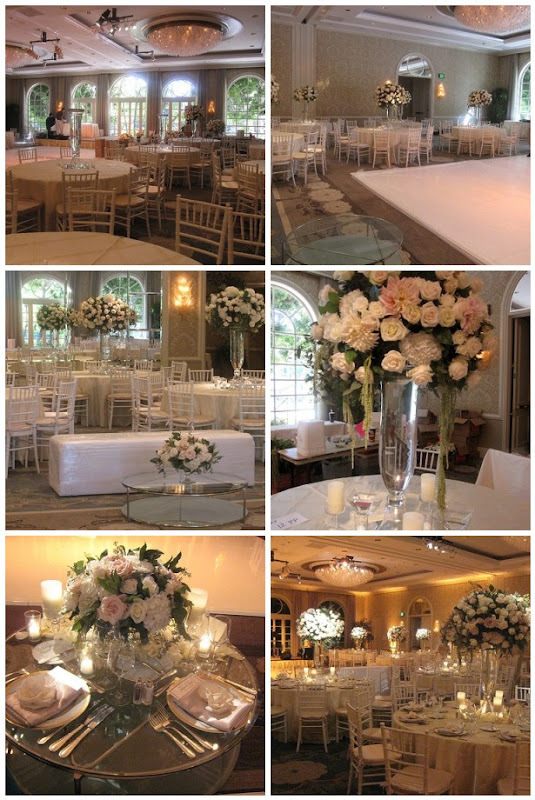 This past weekend we had the pleasure of working at the fabulous Four Seasons Hotel in Los Angeles. I always love working at that property especially because the ceremony site is completely shaded when we are setting up for our ceremonies!! Thought we would share with you another "making of the chuppa" today. Step 3 - Intertwining of curly Willow, seeded eucalyptus and magnolia greens to give the flowers some texture. This is the element that helps the design to appear very natural and organic. Step 4 - a little lighting...and you have a gorgeous wedding Chuppa! The Hidden Garden was honored to be the florist of choice for the Dodger's post season celebration thanks to Party Planners West! 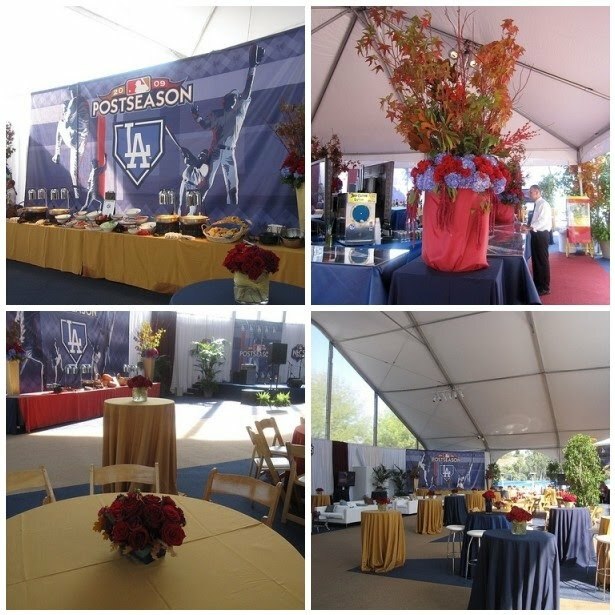 We welcomed them into the National League Championship Series with majestic tall arrangements on the main tables and beautiful richly colored low arrangements for the cocktail tables; all the while still incorporating the season's foliage and fall colors. We look forward to them taking the Championship and being part of their many celebrations to come, Go Dodgers!!! We already blogged about Shelby & Jason's wedding this past weekend (reference post on Monday, 10/12) but we just received some wonderful PROFESSIONAL photos from Miki & Sonja Photography! Of course, their photos capture the colorful details better than ours so we thought we would share a few of those images with you! 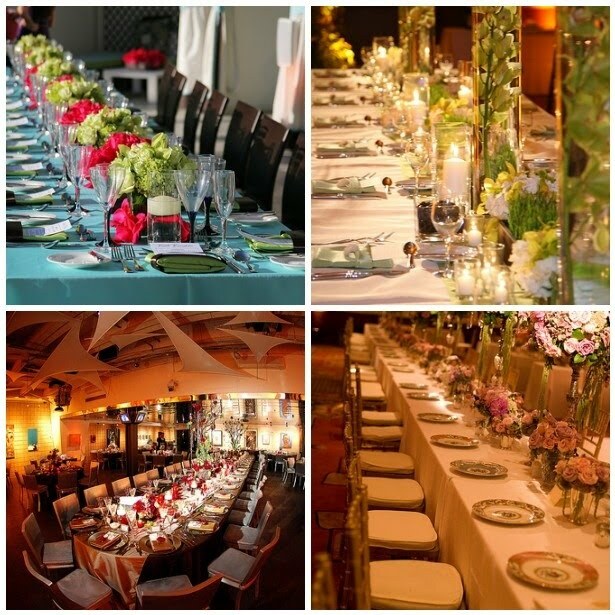 Long tables known as "Feasting Tables" are a great alternative to the typical round tables used at most events. They create a communal feel by allowing more guests to be seated at one table like family and share conversation - plus, they leave more room for the dance floor! As you will see in the pictures below, feasting tables can be used with all types of décor. From the elegant and traditional to the contemporary and modern, feasting tables are really something to feast your eyes upon. For a clean modern look, try using monochromatic or mono-botanical arrangements of the same height. For a more traditional look, I love arrangements of varying heights that give the table several focal points.
" We can’t begin to thank you enough for the gorgeous flowers. They were spectacular—and believe me, there was a lot of “buzz” and talk, especially about the chupa flowers. 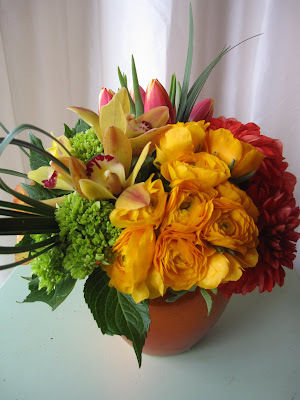 The centerpieces were absolutely wonderful—the richness of the colors and quality of the flowers, anyway, I could go on and on! Shelby loved her bouquet as did all the “maids” in the bridal party. Everything was perfect and wonderful, and we appreciate all your time and care." It's clearly fall time at the Hidden Garden, as many of our arrangements this week have taken on tones of amber, yellow and browns. 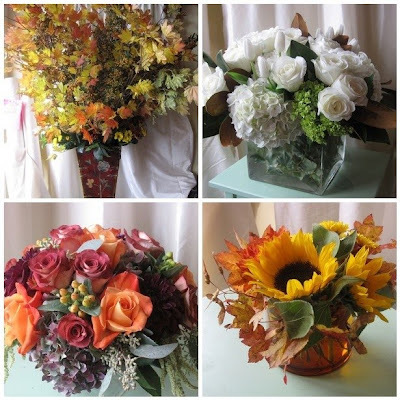 Vibrant ranunculus, tangerine dahlias, rustic cymbidiums, crimson maple leaves, sunflowers and leonidas roses are used in so many of the gorgeous fall bouquets that went out the door for daily delivery this week. If the fall pallette isn't your favorite but you still want a touch of the season...we can always add in a few magnolia leaves to an all white bouquet to help get you in the mood. 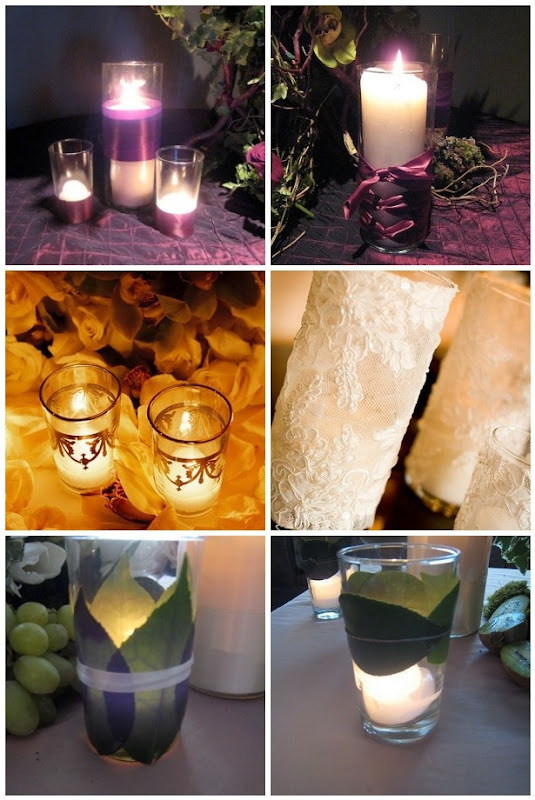 New Inside Weddings Post On Candle Treatments! 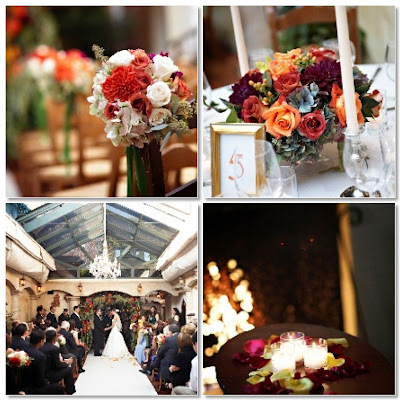 A wedding is all about celebrating romance, so a romantic tablescape with lots of candles is key! 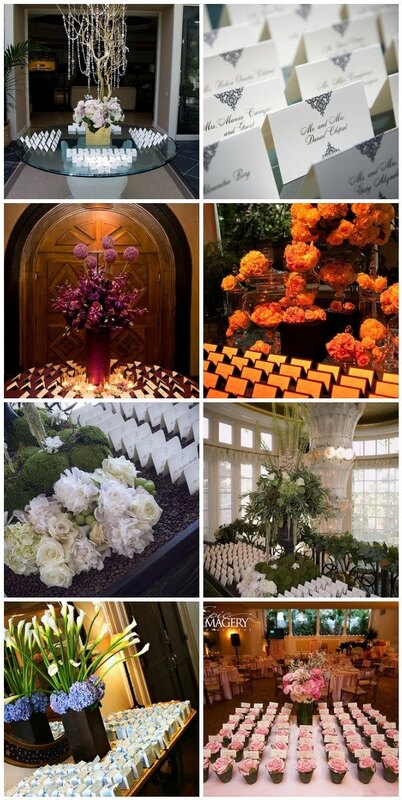 Read all about my favorite candle treatments on my latest blog post for Inside Weddings. In the meantime check out the pictures below for a sneak peak. Fall has arrived at the LA flower market. 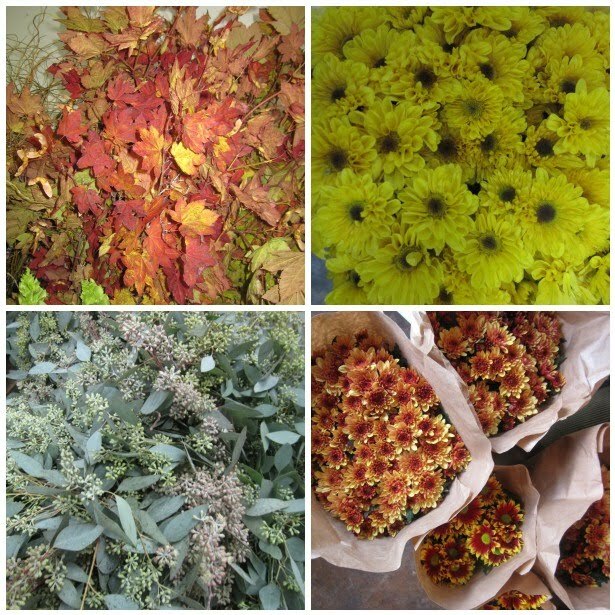 There are so many amazing textures available for your fall arrangements. The fall maple leaves (love the colors) were so gorgeous. A huge vase of leaves would be breathtaking if you want to take the simple route in your home. The Seeded Ecualyptus berries were lush and abundant today. Removing the sage green leaves and just using the berries mixed with your florals adds a nice textural element to any design. One of my favorite fall plants is out now too - the mini button mums in great tonal fall colors! Aisle Treatment...which will you choose? Yes...i said Minnesota! My family and I were there this past weekend visiting with some of our dearest friends. It was just breathtaking to see the seasons start to change from Summer to Fall (something us LA folks don't get to see too often!). Although we were a little ahead of all the leaves changing we definitely got a sneak peak of the vibrant red and orange toned maple leaves. One of the more interesting parts of our trip was the visit to the Minnetonka Apple Orchard! Often times we get a visual of the apple blossoms at the LA market during the spring....but this was the real deal for the fall! 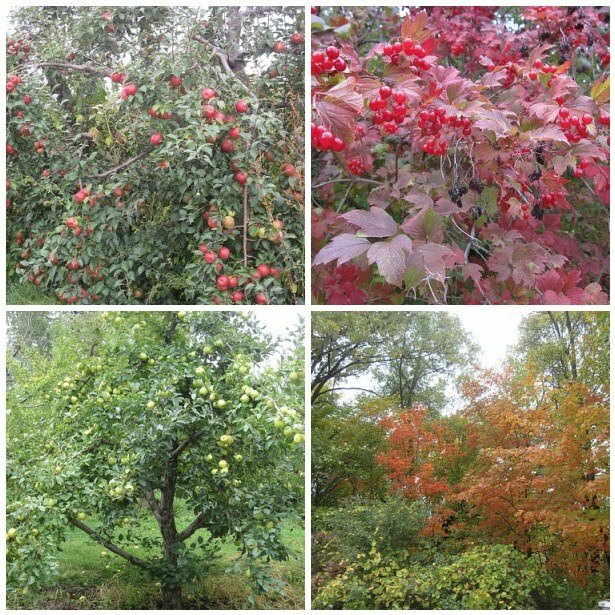 The Trees were covered with hundreds of gorgeous red apples!! I wish I could have clipped the branches right off the tree and used them in an arrangement! From mini crab apples to the most delicious tasting Honey Crisp apples...it was all magnificent! New Post For Inside Weddings: Place Card Tables! Place card tables are just one more way for couples to express their creativity. The place card table is often a preview of what awaits couples at the reception so it's important to have it reflect the décor going on inside the reception. You can transform the place card table into something whimsical, elegant or clean and simple. The possibilities are endless and you can read all about them on my new post for Inside Weddings here. At The Hidden Garden, fall is upon us. We have beautiful fall leaves in our window and the color of flowers are turning from bright summer tones to rich fall hues of amber, mustard, burgundy, eggplant, orange, and green. Arrangements are having much more texture of lush greens & berries. Sweet New Post Up Over At Inside Weddings! You may wonder why this week's Inside Weddings post is sweet, but it really is because it's all about flowers for your wedding cake. Not only is it sweet and tasty, but it also smells good and will have you wanting seconds! A wedding cake is on display during your wedding reception and is a backdrop for many of your reception photos, so it is important that the cake represents your overall wedding décor. 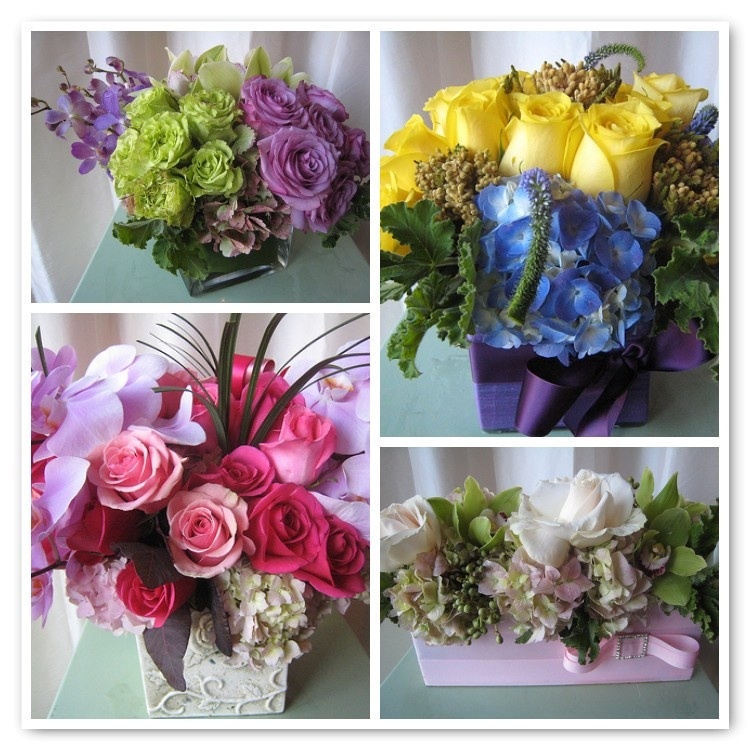 Many people choose to do this by incorporating flowers into its design. Read all about it here and let me know what kind of flowers do you love to see on cakes?